The Mihintale Aloka pooja organised by the Associated Newspapers of Ceylon (ANCL) for the 53rd successive year commenced on Friday. It is sponsored by Dialog, Bank of Ceylon and Abans and co-sponsored by the Ceylon Electricity Board. Mihintale Rajamaha Viharadhipathi Ven. 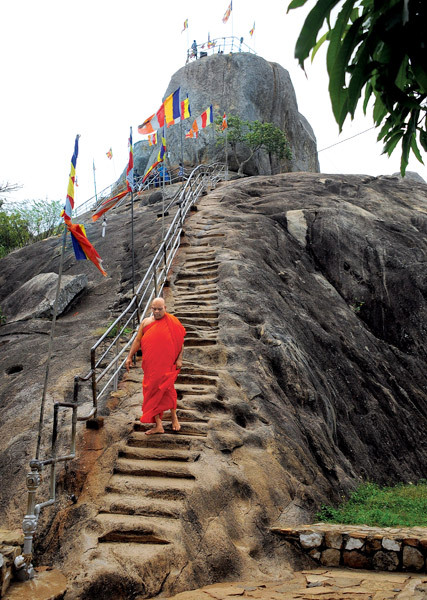 Walawa Hengunawawe Dhammarathana Thera has called upon pilgrims to avoid bathing in overflowing tanks, consuming unhygienic food, refrain from consuming liquor and beware of thieves. Life-saving units from the Police, Army, Navy and the Air Force will be on duty, with AIA Insurance Co. personnel in attendance. Two hundred and seventy eight political prisoners whose release the Tamil community has been agitating for several years will soon be granted their freedom following talks with the Tamil National Alliance, party frontliner M.A. Sumanthiran MP told the Sunday Observer. Voting rights for Lankans in South India? Sri Lankan refugees in South India may be restored their franchise rights shortly for the first time enabling them to vote during elections in Sri Lanka, from their current place of residence. Elections Commissioner Mahinda Deshapriya said if Parliament passes a Bill, removing the legal barriers, arrangements can be put in place to allow the refugees in Tamil Nadu to vote during local elections. No politician who changes his party allegiance will be given nominations, according to an agreement reached between President Maithripala Sirisena and Prime Minister Ranil Wickremesinghe. This decision was arrived at to herald a new political culture in the country, it is reliably understood. President Maithripala Sirisena has ruled out a demand made by some senior politicians of the United People’s Freedom Alliance (UPFA) to form a UPFA-led ‘caretaker’ Government prior to the Parliamentary general election, the Sunday Observer learns. This group of UPFA seniors is understood to have pressed the President to expel the United National Party (UNP) from the current Government before the general elections. The Ministry of Resettlement, Reconstruction and Hindu Religious Affairs is holding talks for the release of 18,000 acres of land in the North from security forces’ occupation to resettle displaced Northern Tamils on their own lands, Minister D.M. Swaminathan told the Sunday Observer. MR running out of nomination options?